A High Definition 1080P DLP, 4200 Lumens, Portable Projector. Great for gallery installations, showing movies and many other applications. Full HD 1080p clarity combined with vertical lens shift and amazing colors, make the compact Optoma EH415 projector an ideal candidate for both desktop and installation use. Noise Level (Eco mode): 35dB min. 3D Compatibility: Supports all HDMI 1.4a mandatory 3D formats (Frame pack, side-by-side, top-bottom) and up converts frame rate from 60Hz or 24Hz to 144Hz (i.e 60 or 72 frames per eye). 3D glasses are needed and are sold separately. Refer to user manual for details. 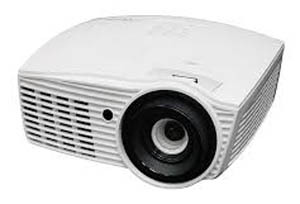 Full HD 1080p DLP projectors which output 4200 lumens. Supports 3D. A great choice for gallery installations.